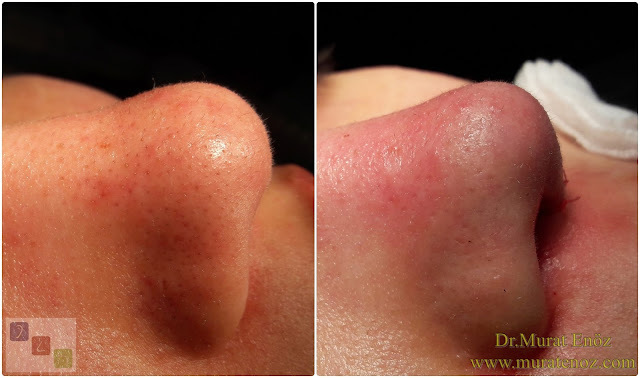 Due to the previously traume (fall on the nose the) nasal septum warping (nasal septum deviation), droopy the nose tip of the patient who emerged from the open technique of nose tip aesthetic surgery and nose tip lifting were done. The video shows how droopy the tip of the nose tip is before the procedure, and then the tip of the nose changes forward and slightly upwards. Nose tip sagging when laughing, nasal congestion, nose tip drop, such as the operation is directed to different defined complaints. I re-uploaded the same video with "Magisto". Because the music is so beautiful and different, I wanted to share it with you. How to open technique nose type plasty operation performed? The procedure is usually performed under general anesthesia. After local anesthetic infltration, a 5-sided skin incision is made on columella (the part that divides the nostrils into two). Nasal tip cartilages are presented. 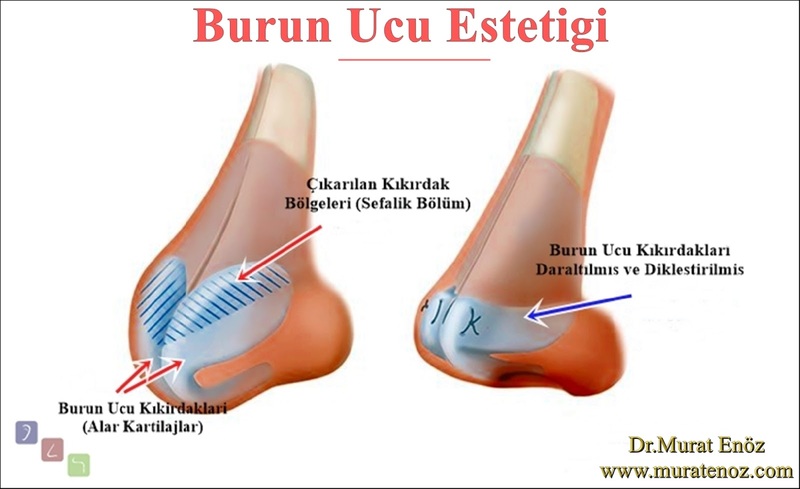 It is removed from the upper regions of cartilages (cephalic sections of alar cartilages). The sutures are discarded (transdomal and interdomal sutures) to narrow the angle between the inner and outer legs of the cartilage. Between the inner legs of the nasal cartilages, a thin cartilage graft from the nasal septum is placed vertically to provide the nasal end support, and the tip of the nasal tip is sutured to the inner legs of the cartilage. At the end of the procedure, a subcutaneous arrow or cartilage graft may be placed at the tip of the nose. The skin is stopped by stitching the skin. In addition, septum deviation surgery and turbinate radiofrequency surgery are also performed. At the same time, both functional and aesthetic problems can be eliminated. I do not prefer the use of non-melting suture material and additional cartilage grafting that may disrupt the natural appearance of the nasal tip.